The Chamber’s Public Affairs and issues committees diligently meet and develop guiding principles for the Public Policy Guide, which is evaluated and updated annually. The Public Policy Guide contains the Chamber’s recommendations for lawmakers in key policy areas that impact business: Agriculture, Environment & Water; Budget & Tax; Insurance and Health Care; Legal & Regulatory Reform; Transportation & Infrastructure; and Workforce Readiness. 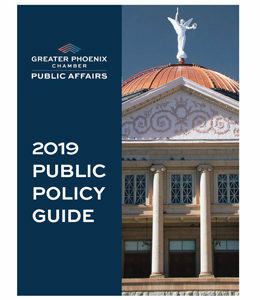 The Public Policy Guide also emphasizes budget principles, which aim to maintain the fiscal integrity and prosperity of Arizona and Phoenix while maximizing job creation and retention and balancing the budget.